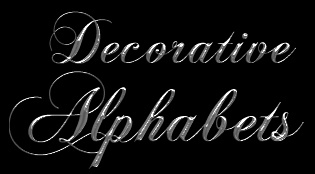 I ran across some of the most outstanding alphabets on the Web. The above link takes you to the graphics site (which, once you see it, you'll know why I didn't want to lose the link). And here are her alphabets!!! These alphabets are missing 4 letters in each set (Q, V, X & Z). As long as you don't need these letters, these sets are worth a look. E-mail the Webmaster and she will send you missing letters.